Augustine’s Catholic Church which is located in the Nenger area of Makurdi in Benue following the “appearance” of an ‘image’ of Jesus. 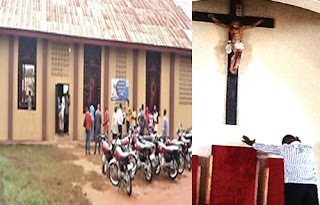 New Telegraph reports that the church which is situated behind Government Model College became a hub for Catholic and non-Catholic worshippers after bright image fell on the crucifix of Jesus. The crucifix is described as a structure of Christ when he rose from death after he was crucified and buried and according to witnesses, it had on its head a crown, while the entire body was glittering, like precious stone. It was reported that the sight first appeared during a church service on Friday, August 5 and attracted a large number of visitor to the church. Mr. Emmanuel Hembenkaan who is one of the parishioners in the church said the light overwhelmed the whole church and he was shocked when he saw it. He said this was the first time such occurrence would happen in the church and suggested that this takes place when the people in a place were suffering and had prayed hard for God’s intervention. He admitted that the sighting has brought a crowd of people from different parts of the state to see the image of Jesus.